Soft grip spring loaded handles for ease of use. 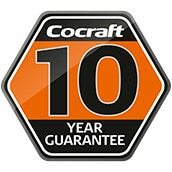 We are proud of our products and it is very important that you, as a customer, are happy with the service and products we provide.This is why we have a 2 year guarantee on most of our products and on specific products we leave a 25 year guarantee. The only exception is on consumables (such as batteries and light bulbs).Keep a look out for our guarantee-logo next to your chosen product to see what guarantee package it has. Our guarantee means that the product is expected to work just like we have described it during the time of guarantee we have promised (This in addition to the rights under consumer purchasing).